Michael Traill is an interesting man. He jumped ship from Macquarie Group in 2002 from no ordinary investment banking job. He’d helped create an entity within Macquarie that picked potential commercial successes and then helped them get to scale. Entrepreneurial icons like JB HiFi. Would these learnings translate to the social purpose sector? 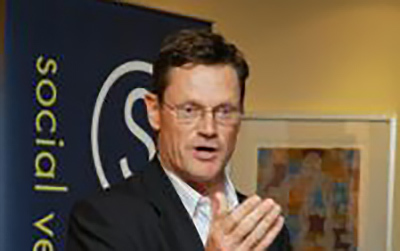 That was the journey he would go on as CEO of Social Ventures Australia (SVA). Ever keen to cut new terrain, Michael and a cross-sector group of nonprofit CEO’s then moved to rescue the collapsed and discredited ABC Childcare group and convert it into a non-profit chain of childcare centres. Michael is now the Chair of that entity, GoodStart, and continues as ever as a straight talking, sector changing leader. Tune in to this podcast interview with Elise Sernik as he talks about Chairs and CEOs, Boards, Leadership, and the marriage of head and heart. If you enjoy this Leadership Space podcast give us a 5 star review in iTunes – it helps others find us! 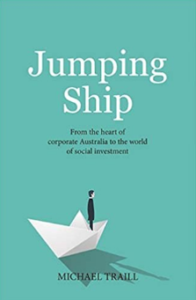 Michael recently published a captivating book Jumping Ship, which has just been nominated for the Ashurst Business Literature Prize. It really is a great read. Click here to purchase. Elise Sernik:Welcome to the Leadership Space Podcast, where we take up the big questions that are the daily fear for leaders across the incredible part of our economy, the social purpose sector. We talk to CEO’s, founders, directors and innovators who are transforming the world for good. I’m Elise Sernik and I’m the Managing Director of Leadership Space. We’re all about thriving social purpose organizations and we focus on the areas of leadership and culture to achieve that. I’m really excited and thrilled to be bringing you a fantastic guest today. I met Michael Traill around a decade ago, but I’d heard about him well before that. He’s someone who’s very much contributed to my own professional growth and many others. He’s been part, I think, of a profound change, actually, in the Australian social sector. 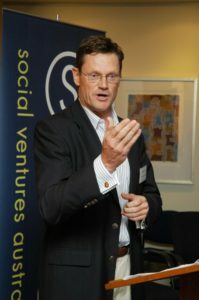 Michael joined Social Ventures Australia, known to most as SVA, as the founding CEO in 2002 and he ran it for ten years in partnership with the equally impressive Jan Owen. Michael came to SVA after 15 years as a co-founder and Executive Director of what has been called the Millionaire’s Factory, Macquarie Group. Very importantly, he came from Macquarie Direct Investment, which means his commercial job was all about investing and scaling social successful commercial businesses. I had the privilege of working in the consulting arm of SVA for four years, and so I’ve had a fair bit to do with Michael over these years. Today, Michael is Chair of GoodStart Early Learning. He’s the chairman of Assetic, a director of MH Carnegie & Co, and [Sun Super 02:48] and a member of the Council of the National Museum of Australia. In 2010, Michael was made a member of the Order of Australia in recognition of his services to nonprofit organizations. Welcome Michael. Michael Traill: Nice to be with you, Elise. Thank you. Elise Sernik: I’ve been enjoying your book, Jumping Ship,immensely. What has been interesting to me as I read it is that, this notion the metaphor that you use of ‘Jumping Ship’, in some ways it’s starting to not fit from me. I had this image as I read the book of almost like a close islander canoes with the two [bells 03:20] and somebody nimble moving between the nonprofit and the commercial, the continuity I’ve read in your history that, yeah, that was surprising. Michael Traill: Yeah, it’s an interesting title, ‘Jumping Ship.’ And I think you’re right, you know, there’s something kind of cute about the idea of jumping ship from one supposedly career in one world to a very different career. But I think the truth is, as the book hopefully teases out that in terms of my background and the values that I grew up within a pretty tough community, but values around family and community I think have been a constant thing in my life and I feel very strongly that the distinctions in many ways between the business world and the social purpose world are often pretty artificial, actually. I’ve met plenty of decent high integrity people in the business world. I had the privilege of working with Macquarie Group for 15 years, and that was overwhelmingly a positive experience. I equally have had an enormous learning journey and continue to do in the social purpose world, but the idea which is kind of implied in the book which I was always on the receiving end a lot of when I did jump ship and started nonprofit, was that in some way a kind of jump from the dark side to the good side and I always felt a discomfort with that. So yes, jumping ship’ is a metaphor for something but at another level it’s perhaps slightly misleading. Elise Sernik: I think that’s interesting your reflections that, there are good people on both side, smart people on both side, that there isn’t kind of, and the way that your journey and your interest in the sector seems to have been very longstanding. Were they interests in, perhaps not the sector, but the interest in social change or doing good or being a citizen is a longstanding one? Michael Traill: I think that’s true, and I think, again, the book going back into the history, you know, the [inaudible 05:18] launch “Show me the boy at 7 and I’ll show you the man.” So the formative influences for me very much around a set of values in an interesting, the broader community that I grew up at home with. And I think in a sense, the opportunity at Social Ventures was in language I could hopefully articulate more clearly now than I could have in 2001 and 2002. But it was profoundly about: could you find smart ways to connect head and heart? Were there business and strategic skills that I’ve learned in a 20-year career in private equity and at Macquarie Bank and elsewhere that will be helpful and relevant in driving a social purpose agenda? And I knew that I wasn’t alone in wrestling with that question. So one of the things that struck me when I had my first interviews with the thinkers in nonprofits who were behind the idea of the Social Ventures Initiatives, as it was then called, was that I knew from a bunch of conversations, I wasn’t the only one who was thinking: how can I try and use those skills in ways that might make some sort of difference? So I felt that it was captured in the original material around the Social Ventures Initiative, that it was an idea for which the time has come, and I found that incredibly powerful and alluring. Elise Sernik:So back in 2002, what did you see in the nonprofit sector that you thought you, you know, the commercial sector had something to offer or vice versa, what we’re looking at that you saw? The second thing was, which was more personal, was that I’ve been thinking for some time about how can I engage more fully in the social purpose world. So it was an idea which resonated, but what I didn’t know really was would there be a pool of social entrepreneurs and ideas and programs that would be a receptive audience and the challenge which faces all startup nonprofits CEO’s, which is what I was on February the fourth, 2002, the day that I started was: how do you make that real? Is there really a demand for that? And obviously, then the nontrivial nonprofit challenge of trying to build an organization on a sustained funding model to support and nourish that. Elise Sernik: Yeah, and I remember, it’s in your book too, and I’ve heard you say it before that what you knew about the nonprofit sector back in 2002, would fit on a postage stamp. Michael Traill: That was very true. Michael Traill: So I think that was understandably the cause of kind of considerable nervousness and anxiety on my part and that of others. There were a couple of data points that were very helpful in affirming that. One was a vivid conversation I remember with the board. And part of a launch we had generous funding support from the IMP Foundation. So launch program was an initiative called the SVA Big Boost, and the idea was we’d have a pool of funding. It was a massive dollar. It was 250,000, so we thought that would be spread possibly a bit thin. But the strong reassurance from the founding board and the nonprofit CEO’s who did knew the sector a lot better than me, was, “Don’t worry about that, Michael. If you put a shingle up saying you’ve got funding available, there will be people and they’ll be plenty of them and organizations who would come forward,” and they were right. The second data point which was an early lesson, was this idea that to engage in the sector, and it was very good advice from somebody who had a considerable and successful career in both the business and social purpose world, was, “Michael, you have to understand when you’re engaging with the social purpose nonprofit world, there’ll be a lot of skepticism, there’ll be a big elephant in the room about: what’s your background? What’s your credibility? And even if the people you’re dealing with don’t say it explicitly, understand that the subtext of a lot of their conversations will be: we don’t care what you know, until we know, that you care.” And I thought that was quite profound and very true. So that notion of listening, building trust and relationships and that this would be a game of patience and understanding, particularly given my relative lack of depth of knowledge in the sector. So to have a board of nonprofits CEO’s, and as you know, my great friend and colleague Jan Owen, who I describe as a serial and successful social entrepreneur and who figures rightly and prominently in the book as a key part of the founding architecture when she joined a few months after the establishment of SVA. I think in and of itself, the way Jan and I work together effectively was a good demonstrator that you could have on the one hand, me as the stereotypical ex-private equity, ex-millionaire factor, on the other hand, he’s the do gooder in the air, the social entrepreneur and we worked out pretty quickly that we were really quite strongly aligned on most of the key things and the effectiveness of that professional partnership, I think was to demonstrated to the organizations and the social entrepreneurs that we wanted to work with, that you could actually make one plus one equal a bit more than two. Elise Sernik: And as I’ve watched you over the years, and being reminded of all of that our through reading the book, the stories of what you achieved at Macquarie, the growth stories, the businesses that flourished with backings, really striking; can you tell us about what happened when you started applying that knowledge in the sector? Michael Traill: Yes. So the lessons in learning from Macquarie Bank in the commitments funding investments that we made; we invested in 42 businesses that involved a total capital pool of pretty close to half a billion dollars. And look, the defining lesson of it would sound cliche, but it was absolutely true, that the driver of success was backing the right people, the right founders, the right CEO’s, and obviously, attached to that some pretty thorough industry analysis as well. But the privilege of that experience from my 20’s to 41 when I left a full time career at the bank was, if you listen and learn. I’d like to think I did both of those things. You really build a stock of experience sets around what works and what doesn’t. So the plausible hypothesis in starting Social Ventures was that hopefully a chunk of that, and always felt hopefully at least 70 or 80% of that would be helpful or relevant if it could be applied sensitively to a different social purpose, what would be true. I find people who know what they doing, look for programs and organizations that are building, that have got evidence that what they’re doing is working, make a difference and provide them with the support. Not just the funding, but the advice, engagement around strategy, around the sort of things that we’ve done, I think, reasonably effectively at Macquarie where often writing of a cheque was the smaller part of actually great evaluating and accessing and tapping broader networks of support that could help those organizations grow. And so the yearly experiments at SVA were really: could you apply that model of venture capital support to the social entrepreneurs? And if they were receptive and wanted to engage, would that yield the same results? And I think the heart of a sphere, and it continues to this day under the leadership of my successor Rocosko, is that alchemy of finding people who are running great programs, are interested in scaling and growing the reach of their work, and where their work has enough data points, as you know, around some of the organizations we’ve had the privilege of working with closely like the Beacon Foundation, do terrific work in bringing employment opportunities and path ways to encourage kids in some of the toughest schools in the country. So when we met them in 2002, they were a successful Tazmanian based programme in half a dozen schools, you know. Now 15 years later, they’re in a 140 plus schools and they are changing lives and they’d be kind enough to set aside that strategic and network partnership with SVA was pretty critical in that growth. So that’s hugely gratifying when you can have those partnerships and relationships and see that with the passage of time, they have made a difference. Elise Sernik: And it’s interesting, and I’m reflecting as you speak now, that those early social enterprises that you invested in were quite small in comparison to the large organizations you used to investing in through MacQuarie group. Am I right? It sounds like the lessons applied though, that whether those with small organizations or large, that actually there’s a consistency in what you’ve found works, you know. Michael Traill: Yeah I think there was a high degree of consistency. And actually to your point, the parallels, I think, were incredibly close. We did a major strategic review in 2009/2010 and we analyze quite closely the spread of answers that we’d supported and what had worked and what hadn’t worked particularly well. And one of the defining conclusions of that, was that the organizations, the earliest age start up organizations at SVA, hadn’t worked brilliantly, you know, that higher risk end of the spectrum had not been particularly effectively done, and that was actually a replica of the commercial experience. Our focus at Macquarie was organizations where there was a track record, it was evidence that it was a Chief Executive who was doing a good job but there was still plenty of capacity to grow. And the truth was, at SVA, the most successful partnerships were where we had identified programs where, as with Beacon, they are in six schools, which is still small scale, but you could really scratch and smell and look at what was the performance of those schools. So I think in the most successful engagements we had there was enough evidence of quality of leadership, quality of program, to take and scale and grow that. I think the other defining lesson out of 2009 and 10 when we reviewed that, was we learnt to develop a quite tight screen about what we called “capacity to engage.” In capacity to engage was on the part of the social entrepreneur, a very three-dimensional understanding that the partnership with Social Ventures was actually not just about the funding but it was about the engagement in terms of the strategy and the growth. And we never pretended to be a particularly easy partner in the sense that we were challenging and demanding. We wanted results and outcomes. We felt we had that duty of care to our funders. I was pitching to our founders on the basis: you made money because you were smart and disciplined. When it comes to the active, giving it to organizations, sure you’d want to apply the same set of metrics rather than it just be thrown away. And that was a core part of, that was the accountability and responsibility we felt that our social investment in the organizations we backed, provided evidence of results and where it didn’t, which was a hard thing to do. We’re quite transparent about what wasn’t working, and that meant not continuing funding in some cases, exiting programs that weren’t working. So testing for that capacity in the genuine desire to engage and I think in hindsight our biggest mistakes were with CEO’s who might have said that or implied that but they weren’t really upfor that. And so I think we learnt to be much more thoughtful in terms of those partnerships to establish whether that capacity to engage really existed. Elise Sernik: Yeah, and I mean what I love about what you’re saying, it resonates with me and my work, is that you’re backing success. And is it, you know, sometimes I hear that sort of sensitivity or a preconception perhaps in the sector that if you are getting any kind of support, mentoring, coaching, development, investment that’s got a capacity building component, that it’s somehow a mark of your [inaudible 18:19], that we should, you know, in the sector, you should need to go it alone, is part of what I’m hearing you say. Michael Traill: Yeah. I think that’s still an accurate observation, probably in too many parts of the sector. I think, and I’d like to think SVA and the work we’ve done has contributed to that, but there’s been, I think, a bit of a seat change over the last 10 to 20 years, in the fact that many philanthropists, I think are at an individual corporate level being a bit more clear and explicit about we want to invest in you, we want to see evidence of what you’re doing is working, we want to engage in a supportive way, but we do want transparency and clarity around outcomes. So I think the ground is shifting on that, and equally, I understand and respect this is a double-edged sword. There are many cases where corporates or individuals have an unrealistic set of expectations in either in some cases interfering. I’ve certainly seen examples where you can have multiple funders with different expectations of reporting that’s quite confusing and incredibly draining and time demanding for the organizations they funding and supporting. So I think there are challenges both ways. Elise Sernik: Some a really good partnership where you’re actually genuinely interested in the leader thriving in achieving what their vision is and the people within that organization fulfilling their potential as opposed to sort of here’s the hurdle, jump this high, you know. Michael Traill: That’s right. And I think again, what’s the solution to that, reflecting on those lessons from the first five to eight years of SVA’s operations. You know this would sound like it’s in the bleeding obvious department but really being quite explicit in dimensional about: here’s how we operate. Here’s how we work here, here’s what our expectations are. Desire line with how you see it and really pushing that, what Jan and I would call a fierce conversation, and I mean to have that up front because I think if you can do that with integrity on both sides… I think one of the advantages for us at SVA was that we were both a grant maker but also a grant seeker. So that was really quite helpful because I knew, and I can think of examples in the early years, where we were seeking funding, and I think some of my biggest mistakes as a CEO were either wasting time with funders where there wasn’t alignment and we have to get smarter than that. So we realized pretty early on that longer dated particularly high net worth funders where there was a relationship of trust and integrity, and I recall in year three, I had known the organization, it was kind of corporate base foundation but they were quite interested in a partnership with SVA and it would have been for us quite a significant partnership. It was the order of $300,000 or $400,000. It was meaningful though. But it’s very clear in the conversation that they rotated their charity of choice annually, and they were a bit taken aback when I said: “What’s the capacity for at least a three-year partnership,” and they said, “No, that’s not the way we work,” and I said, “Well, actually, that’s not the way we work either and I understand and respect if you don’t feel you can do that, but frankly, in terms of the relationships that we want to have, that doesn’t fit.” Now, that wasn’t an easy decision, but I think it was absolutely the right one. Elise Sernik: Yeah, those big, brave moves that sort of set culture and strategy. With the benefit of all your commercial and nonprofit experience now, and that goes into 20 plus years or more, and you’re still investing, you’re still playing that role. When you see your social purpose organization now, is there anything that you’ve learned that you didn’t know back then about? Is this an organization that I would spend time on, that I would introduce to the people I know, that I would put my own money on? What are you looking for that you, perhaps you know, anything else other than the things that you’ve talked about that helps you know, look, smell, you know, this is an organization that really can flourish. Michael Traill: To get a couple of things, one of which I learned from Jan Owen to be very particular about which is, a much more explicit now than I know SVA is around: what’s the evidence that you partner in the sector? And it’s a really interesting question because there are many entrepreneurs, Jan used to call it “terminal uniqueness syndrome”, where the response of the social entrepreneur will be, “Oh, what I’m doing is really unusual and very different and it might be a ‘use at risk’ program, and if you interrogate that reality, Jan could quickly disabuse me or others of the notion that actually there is another half a dozen right programs working with pretty similar cohort of young people and doing things differently with different results slightly but significant overlap, so that idea of, and that’s a really good testing question of how differentiated are you? What are your results? And most effective social purpose organizations in my view are very explicit about partnering so that was a big learning lesson. Secondly, I do think there is a common denominator of quality of leadership alignment around accountability and metrics. So that, I think is consistent across the sectors. The third thing I get asked quite a lot: what’s different in terms of what’s more to look as to a business and social enterprise and the organizations capacity to grow? I think there’s a subtle but significant difference attached to the notion of scale in the social purpose world. And the way I always characterize that is to use the illustrative example in my Macquarie days. We did a lot of quite successful retail investing in companies like JV, Hifi, Miller’s Fashion Club, the Reject Shop. And we learned quite a bit about retail and what drives retail success. And if you’ve got a good head office, good leadership, good point of sale, the right site selection, you’ll do well. Even if you’re expanding into sites where you put a good but not necessarily great store manager, you’ll do okay. That doesn’t quite translate in the social purpose world. Elise Sernik: Because of relationships? Michael Traill: Relationships on the ground and in community is deeply important; I think way more important than it is in the business sector, because if you don’t have that grassroots passion and engagement, and I always use the example of Beacon and Scott Harris who as being the very effective Chief Executive. They will say they learnt some very quick lessons that they just don’t have the capacity to go into communities unless there is a school principal as leader who is deeply engaged in the community, passionate about the Beacon offering and their work and knows how to drive that in the community. That has to be a core screen for them. And when they backed principals who were okay, but not great, they failed. And so I think learning to explore that dimension of scale and growth is something that is different as between the sectors. Elise Sernik: I recall some of those discussions from within SVA. On that and in the terms of leadership, if we jump ahead to SVA and sort of being within SVA, what did you want from your chair and board as the CEO, so you in the leadership role as opposed to the ventures that you are backing? What would you bring as a CEO to that role? Michael Traill: I think the engagement with the board is pretty critical. I mean it always is. My perspective around the board-CEO relationship is having worked in roles as a CEO, obviously, but in a lot of boards and so a kind of like to think I say it from both perspectives. There are three things that I think are fundamental; one is, I think it’s really important that a board support the Chief Executive, I think that’s key accountability. I think if the board as got the wrong Chief Executive, I need to do something about it, that’s pretty fundamental. Two, I think the board should appropriately challenge and push the CEO. I always like boards as a CEO where there was constructive, thoughtful challenge around what you could do, how you could stretch. And I think the third thing particularly in the social purpose world is that you really want people around you who are genuinely passionate about what you are doing. And I think in truth, if I’m being candid as CEO, the directors that kind of left me cold and didn’t do much either for me or for the business were those that just, they didn’t really understand what SVA is about or they weren’t passionate about it, and to be frank, I wasn’t that great familiar with the organization, and that’s not to say the more challenge you do but it better come from a place of passion. Elise Sernik: Genuine interest. There’s a lot of, you know, I hear Chairs kind of saying things like, that they are voluntary, how we can’t ask too much of them. We can’t set high expectations that they show up, or that they give more than…What’s your take on that? Michael Traill: I think as you well know, it’s kind of a pet bugbear of mine. I think if we want professional standards and high quality performing boards, people like that shouldn’t be on the board and we did a lot of work, and you’re involved in a lot of that at SVA. I know around here, we test and create relationship opportunities where we know that somebody has walked that walk of journey and understanding that there’s a confidence that they can contribute and there’s the fierce conversations so that when the time is right to invite somebody on to the board, there is clarity of understanding about what the expectations are and the capacity, nicely for that relationship to be ended, if there’s not contribution. And that fundamentally sits with a high quality Chair. But setting up governance structures, I don’t think they need to be heavy handed. A lot of this is about the candid conversation. So I think, again, it’s all pretty simple stuff, doesn’t happen consistently or universally. Absolutely not. Elise Sernik: And as you speak, it really reminds me of clients where the fierce conversation I may have had with them is, you know, if that there’s a kind of anxiety or nervousness to really back the organization and: if I really believe in the organization, why wouldn’t someone else? And if I am concerned about parts of the organization, well, then board must be engaged to help address that rather than saying: we’re not perfect, therefore, we can’t attract fantastic people. Michael Traill: And I think clarity of expectations. I do think certainly in the social purpose boards or SVA there was an expectation that they’d be probably a slightly high degree of more engagement, more handson involvement. So still a principle of noses in, fingers out. I think the board is very relevant. You don’t want board second guessing, micro managing at all. That’s destructive, or it can be. This is clear understanding about the value that high quality board directors can head, that I was certainly a recipient of that in many ways at SVA and as chair of Good Start which is a much larger scale organization. We’re the largest provider of early learning in childcare. Next year will do a billion dollars in revenue. We have 13,000 staff, so it’s a one of the largest scale social enterprises in the world. But we have a very clear set of expectations with each director about where they’re expected to be more involved bringing their unique important skills. And that’s usually valued by the CEO and the management team. And yes, there is a set of protocols to ensure that we don’t cross appropriate governance boundaries, but we’re quite explicit about that, we’re just going through a board succession process at GoodStart and that’s prompted a really good quality conversation about the nature of those expectations, the values and the culture fit that we want from people who are joining, and I do think that’s quite different from possibly a more extensive focus on governance and compliance that seemed to have evolved in the business, in the larger scale business world which I find pretty alarming, frankly. Elise Sernik: More on the strictness and policemen and the anxiety kind of risk side and less on the strategic involvement and vision and skills? Michael Traill: Well, absolutely. You know, my friends here on bigger company boards and I’ve had a bit of experience with that, ploughing away through the three to four hundred pages of essentially governance and compliance. I wouldn’t say it’s my natural strength or skill set, but it’s also not my idea of fun or strategic value add to the business, and I think we’ve lost our way a bit on that and I think there’s a lot of people who have got experience around that who would share that view. Elise Sernik: As you talk about your role as a CEO, and then becoming a, you know, in your relationship with the Chair and what you’re looking for and then moving into being a Chair yourself, and I’m thinking of GoodStart here and other roles; what is it that, you know, and I’ve this conversation with the numerous Chairs where Chair’s role is sometimes perceived to be one of sort of the gate keeper between the board and the nonprofit executive team and perhaps as they look for Chairs, they’re looking for people who are well connected but not necessarily good conductors of opinion or capable of, and comfortable with the fierce conversation. What are you enjoying about being a chair? What do you think you are bringing? And other great Chairs that you’ve seen, what do they bring that’s so important in that role? Michael Traill: I think, well, you’re and my mutual colleague, Duncan Peppercorn did a lot of interesting work about what connects a good Chair and what not. And there are a lot of, there was that five or six bullet points, and it included things like being prepared to be a good listener, good at getting decisions out of a group, building consensus. I think to your point, I certainly see the role in this to be consistent with some of the things Duncan figured particularly in the social purpose world as being more an enabler and a facilitator than a traffic cop. And that’s not in any way to trivialize the whole buck stops with the Chair and board about the most critical decision in any organization like, which is: have we got the right Chief Executive? If that’s not the case and you’ve got a Chair and board who aren’t doing anything about that, they fail, and they fail substantially, and I think we’ve all seen our share of that. What I’m enjoying and learning about being Chair, it is a different sort of role and I find parts of that really rewarding and interesting parts of it challenging. I think in my midlife, having jumped ship to SVA, what I learned about myself was that I’m probably a bit more entrepreneurial than I might have imagined in my younger years. And so being the entrepreneur or the idea generator, you have to tread very carefully in terms of how that sits as Chair and I think the idea of working constructively with the CEO and having the capacity to have open conversations where those inevitable clunky bits arrive that are often personality driven and you know, you’re very open about that. I think I’ve got an excellent personal and professional relationship with the GoodStart CEO, Julia Davison, but it means a lot to us to have somebody to help, who happens to be somebody who’s on the board. And there’s as a couple people on the board who can really help as kind of a mediator/facilitate where we have issues or disagreements about things. So I think being able to do that effectively and having continuing an open mind, and again, that’s not in any way to back away from the kind of hard responsibilities or accountabilities. And to the point about that staff engagement enablement, I think it’s monitoring that and there are occasions where I’ve fund as Chair of GoodStart being close enough and developing a culture of trust, accountability where you know with a heart a great confidence, that individual board members can engage with the senior management and there’s transparency and clarity around that. But I think for us at GoodStart, no, I think if you interviewed Julia, I’ll be confident she’d say that’s been a generator of a huge amount of value for her and for the team. And so unless she’s prepared to open up those conversations and tap the extraordinary skills that exist around that board table, we’ve got such an eclectic interesting group of people, you know, Greg Hutchinson who is a managing partner by consulting has got deep, deep coaching skills as well. Rob Costco run a multi-billion dollar private equity fund, Wendy McCarthy who’s one of doyens of social change and hugely respected social purpose and nonprofit lady, June McLaughlin and Elaine Warner who’s got really deep sector in early learning experience. So there’s a fabulous skills set there, so, the idea to me that you sit around that board table and not try and engage those people more deeply is just a waste of talent, and that’s the last thing we can afford to do at GoodStart given the scope of our mission. Elise Sernik: Fantastic. One of the things that have fascinated me and it comes up as a theme regularly with the organizations I work with, curious whether it may or may not be present at GoodStart, and possibly less so because of why the GoodStart came about. But it kind of tension, I think that NDIS organizations that are under the pressure of funding and all other organizations that are sort of feeling the hate financially as government perhaps withdraws, is this sense that there is a, and you’ve talked about the hidden heart, you know, often through the years that I’ve known you, there is a sense that in a way the heart is that front line staff and the head’s the executive and that in the pressure to become commercially viable and innovative and being able to be nimble and customer centric that’s construed in a way by the front line staff as being head stuff that leave out the heart stuff. You’ve got such a fascinating, you know, and kind of unique. I mean there are more people coming through that move from the commercial sector to nonprofit, but as you think about that dilemma, how do you construe it, you know, I don’t know if it may or may not be relevant at GoodStart as well. Michael Traill: I think it’s very relevant and I think that idea of head-heart alignment is profoundly important. My experience has been, and I think that’s the pair of what sits at the heart of SVA and also GoodStart is that if you’ve got an eclectic mix of people who come from different backgrounds and you’re very clear and thoughtful about defining what the core purpose is and the balance in something like GoodStart where if we weren’t successful at a commercial financial level in turning the business around and making money, we’re going to have incredibly limited opportunities to do what we wanted to do on the social purpose. The two are inextricably linked. I think powerfully brought to life by one of the founding nonprofit CEO’s, Tony Nicholson who said, “Well, if we do a great job of quality, I’m absolutely certain it will have positive collateral benefits in terms of the economics of the business.” And of course he was right. So, I think in many cases, the idea that this dichotomy between head and heart is false. Yes, of course, there will be tensions that arise, but if you’ve got the open conversation and this clarity around where the organization is at in terms of prioritizing those things, I do believe you can hold those things in balance. And it comes back to the score card metrics. I think we’ve done a pretty decent but still evolving job at GoodStart of it’s financial purpose metrics, it’s social purpose targets and being very clear about how those two things sit together. And as you know at SVA we’ve had a bunch of experience, big, big chunk of the work in SVA consulting have been around metrics and measurement of influence particularly using very powerful tools like social return on investment. And I think the beauty of that is that it defines alignment and clarity around what is core purpose I think if social purpose organizations have got clarity around what success looks like, it’s amazing how many other things start to fall into place in drawing organizational priorities and resource. Elise Sernik: Yeah, I mean what resonates with me so strongly for me is that if you’ve got in a sense in your board, an encapsulation of all of that dynamic of that tension and the capacity to have the robust conversation and the dance and then pull and push about social and profit and profitability and sustainability, and that you’ve got a metaphor and an example, a culture setting example from the very top about embracing both of these things and holding them as inextricably linked and connected. Michael Traill: Yeah. I think it’s fair to say we certainly saw that at SVA, and I refer to the effectiveness of the fact that Jan and I kind of at a superficial level come from two completely different worlds, but at SVA and GoodStart a bunch of the most effective things, we’ve been involved in Beacon, Jack Manning Bancroft, Australian Indigenous Mentoring Experience. Michael Coombs at Career Track is: why have there been stand out successes? It’s because they look around corners, they draw talent from across the sectors, and they genuinely use the best of both worlds in building thriving, sustainable funding and revenue models, but at the heart of it is absolute clarity about the ambition of the social purpose mission. So, I’ve learnt to be wary of the social purpose CEO’s who see to push back hard on sensible engagement. With business, just as I’ve learnt to be wary of the commercial hard heads who put a toe in the water in the sector and say it’s all hearts and flowers and these people are interested. Well, it might be defective. That person of the commercial background hasn’t have the capacity to do what I was advised to do which is be careful about walking that journey of understanding and avoid the trap of throwing early gratuitous business fixated advice, and I’ve certainly seen plenty of that. Michael Traill: I’ll speak for one of the core values that GoodStart Board which is the idea with that group of people who are pretty impressive heavyweight group of people. I think everybody would say they’ve learnt a huge amount from others at the table, and I’ve particularly learned from those who come from a very different background. So that notion of a shared journey and learning, it changes the shape of conversations, and that doesn’t happen overnight as with all those things I think it’s fair to say through the GoodStart journey and elsewhere that notion of the storming, forming, norming but that process of genuine engagement, open face conversation gets to a place of I think much rich and much more informed set of conversations that deeply help the purpose of the organization. Elise Sernik: And it takes a lot of self-awareness, I think, to be able to have really reflected on yourself and what you care about, what you’re bringing, how you’re showing up, the judgments that you’re making of others. So Michael, this brings us to the final question I had for you, and I agree with you, it’s the tides turning that there’s a greater professionalism in the sector and a greater comfort with the notion of capability and capacity building in the sector. Because of the nature of our work, people confide in us and sometimes along the spectrum of completely toxic cultures where people feel a sort of grinding despair that things will ever change and there’s a willingness to change to just a moderate sense of we don’t know if it will ever be up for this. So I’m really curious, this it seems to me, and I’m interested in your opinion that good leadership, from what you said, and flourishing cultures provide organizations with a chance to do so much more, to be so much more successful than they might have imagined. What questions should leaders ask themselves so they get a really true read on how they’re doing, and sort of a corollary to that, what are chairs and boards need to be asking themselves, boards and each other, so they’re not complicit in holding organizations back? Michael Traill: I think that’s a really important question. My response is that I think to test effectively where you’re at and where the organization that requires the quality of self-awareness and an honesty about testing how you’re performing as a Chief Executive and how the organization is perceived internally and externally. I think for me there are two sanity checks on that I try to be attentive to. One must always have one or two what I called inner voices. So there’d be trusted voices, somebody or a couple of people on the team who you knew had good judgment, who had the ear of a broader audience then you might not, I think you need to be very conscious as a CEO that you might only get sanitized feedback that you can cast because set of footprints than you might think, and you don’t always necessarily get honest feedback and sometimes far from it. So having people who are trusted insiders who can give you that feedback in a pretty uncoated way, I found very powerful. The second on the board front, and you thread carefully here because I think there’s a line of bad board involvement which is “noses in, fingers out,” which I think is important. Having said that, I always found and in particular in my last five years at SVA Richard Spencer was a highly valued board member, but Richard also has got particular skills as a kind of coach and facilitator. He was trusted by the senior team and by me, and there are a couple of occasions where Richard had the ability to get feedback from senior team and facilitated a couple of sessions that were very helpful in terms of providing that counsel and feedback trusted by me, trusted by the senior team where he could provide honest feedback to me and to them about what was working, what wasn’t, what was tricky, what we can do differently and better, and I found that enormously valuable. That doesn’t have to be somebody on the board; in that case it was. But I think setting up those sort of opportunities in an earlier iteration of SVA when we were doing a thorough strategic review, Kim Gibson who was external in highly rated form, McKinsey Partner perform that role. So I think those checks around board external, internal are really valuable. I think there’s a third component of that which is testing thoroughly how the organization is coming across externally. And every few years at SVA we get somebody, return somebody to do that and get feedback from broad stakeholder audiences. And I think that was highly valuable in terms of a reality check and how we’re perceived by different parts of the sector. So those are conversations, candid conversations with funders, with organizations who are working with and supporting with the sector more broadly because their reputation in terms of who we were and what we’re trying to do is very important, and if there’s a dissonance between what you think you’re doing and how you’re actually perceived, then you need to be aware of it and make judgments about whether you’ve got to change your messaging or change what you’re doing. Elise Sernik: Yeah, brilliant that strong piece of the reality check to really know how people inside the organization are feeling and perceiving things and outside. Thank you, Michael. It’s been a fantastic conversation. I’m walking away with a couple of memorable take aways and see if I’ve missed anything. But I think that, you know, the make or break of a Chair and a board is to get the right CEO and your words to fail at that this is your peril to really escalate and put that job at the very top of the list is really, really powerful and resonates for me. The Chair’s job to support the CEO, to pick the right person and then back that person and be supportive but also know that good leaders want to be challenged, they want to be growing in a positive and supportive way. I love your point about requiring value from your directors and that the Chair’s job partly is actually just harnessing that values, so get get good people and then really use that talent for the organization’s benefit. I’m fascinated with this topic of ‘head and heart.’ It comes up so often in our client work and your point around have it reflected in your board. So have the balance of the head and the heart however you conceptualize that, sustainability care, dynamic, and whatch for demonizing or sidelining any of those. That interesting example you bring of Jan and you actually sort of personifies that metaphor at the top of the organization and the power of that. And then your points about the commercial transitioners and investors and others from the commercial sector and being really careful to screen tightly for your own judgments, and not just for the cause, but for the history of the organization, the expertise. Anything I’ve missed? Michael Traill: No. I’ve really enjoyed the conversation and that’s a much more elegant and succinct summary that what I’ve managed to put together. So thank you. Enjoyed the opportunity to chat. Elise Sernik: Brilliant. Thanks, Michael.